117 Hudson: Solidarity. Community. Resilience. Like so many other people both near and far to the areas harmed by Hurricane Sandy and her attendant phenomena I have been trying to figure out how to help. I've disseminated information here and elsewhere. I've bought supplies and delivered them to donation centers. I've given money to others who were helping more directly. Not putting my time in, though, has made me feel like I was not enough. There's an Occupy Sandy center a few blocks from my house and I've been meaning to go there and see if I could help but all manner of excuses came to mind. Finally today I had a couple of hours that could be best spent there so I went. I thought you might be interested in what it's like in case you ever have the opportunity to work with, or even pass judgment on, the Occupy movement. Last year I spent a little time going to Occupy Wall Street and happened upon Occupy Boston while I was traveling. I didn't spend a bunch of time there, I didn't talk to anyone, I just observed and took pictures and tried to spread the word about what I'd seen. I wasn't alone in not completely understanding what the movement was about or hoping to achieve or how it might do that. From what I could tell the way in which they were doing the most good was to bring attention to misappropriation of funds and misguided choices in our greater bureaucracies. I was impressed by how organized the little villages were with town squares, libraries, and kitchens. They were adept at channeling donations and communicating. I assumed that, apart from a few loyal organizers, the movement itself had dissolved. Within days of the storm there was a website and a few outposts organizing donations and their delivery. When you go in to the facility, in this case a church, there's a volunteer sign in desk. Three people with computers sit there and new volunteers sign in on the website and are then directed to get a nametag (sharpie on masking tape) and wait for an orientation. Those meetings were happening every half hour today. Probably the hardest part of the day was sitting in that chair watching everyone else working and not to be doing anything, just waiting. Oddly enough that was mentioned in the orientation. The young lady who spoke to the group of 4 I was in had joined the center on Monday morning. By Monday afternoon she was giving orientation sessions. She'd taken Thursday off and said that many things had changed between Wednesday and Friday. First she reminded us of the principals of the movement. Signs around the church said "People-powered Recovery" and "Solidarity. Community. Resilience." They are anti-racism, anti-sexism, anti-homophobia, anti-classism and we should keep those things in mind as we interacted with others. She explained that the entire operation had been downstairs in the church hall but now that was entirely food prep and up here was the intake, sorting, packaging, and disseminating of donations. There was a communication station in the choir loft where people were manning phones, finding out where supplies were needed and working to get them there. While I was there at least two full UPS trucks full of items from the Occupy "wedding" registry were unloaded. If we wanted to go out in the field to deliver things we'd need another short orientation but we were still given a brief sketch of how to talk to people in communities that are recovering. Listening rather than telling is the most important thing. By listening we can find out what things people need, how they have been coping, and offer some measure of comfort. Sometimes the most important thing for people is to be heard. (That'd be a good lesson for life at any time, not just after a disaster.) We were also told that there was volunteer food downstairs and plenty of water everywhere so we should be sure to take care of ourselves, too. In less than 10 minutes we were on our way. There were a couple of jobs I could have gone to right then and I offered to help sort clothes. There was an area about the size of my living room full to approximately chest high (on me) with boxes and bags full of donated clothes. I reported to a lovely Australian woman named Joy who was doing her best to make sense of it all. We were trying to sort by any kind of category - women's coats, men's sweatshirts and fleeces, kids PJs and jeans - and box up the clothes for easier delivery. We were re-using the boxes that had come off the UPS trucks and just digging through what was there and doing the best we could. It's not a job for anyone who needs to see progress. As fast as we could sort new things were coming in. Though in the 2 hours I worked we'd piled up twice as many boxes as were there when I arrived the area was just as full of unsorted clothing, too. I want to let the parent who carefully packed a box culled from their daughter's things know that I am sure in my heart that every single thing will be appreciated. I sorted the toys into the toy section and kept the warm clothes and PJs all together. There's a whole system for toiletries, diapers, and wipes so I added yours to that. We didn't have a category for combs and hair accessories so I buried them in with the pajamas and pictured how happy a parent in Far Rockaway will be to be able to carefully comb and style their daughter's hair again. I came across a whole stash of woolen pants and skirts that I think were a stroke of genius. They will be wonderfully warm now while people wait for the heat to come back and they'll be useful in work situations later if people are interviewing or having to go back to work. I hope they get to someone who can use them in both capacities. I felt the same way about the caches of high end running and hiking gear. Layering has got to be incredibly important now and having warm clothing that will easily fit under the coats and sweatshirts I was packing up will be key. I want to applaud the woman who clearly cleaned the evening wear out of her closet, complete with hangers. For people who lost everything it will be nice to have some pretty things to wear when they have time to celebrate...many months from now. When I knew I had to leave I felt guilty. I was leaving the two women I'd worked with better off than before maybe but with no less of a chore ahead of them. I apologized to Joy and she brushed it off, thanked me for my help, and wished me well. Maybe we'll work together again, maybe not. No one can tell. I took this picture of the brimming sanctuary before I left. The church will still be holding a service on Sunday morning so all of that stuff will have to go somewhere else before then. 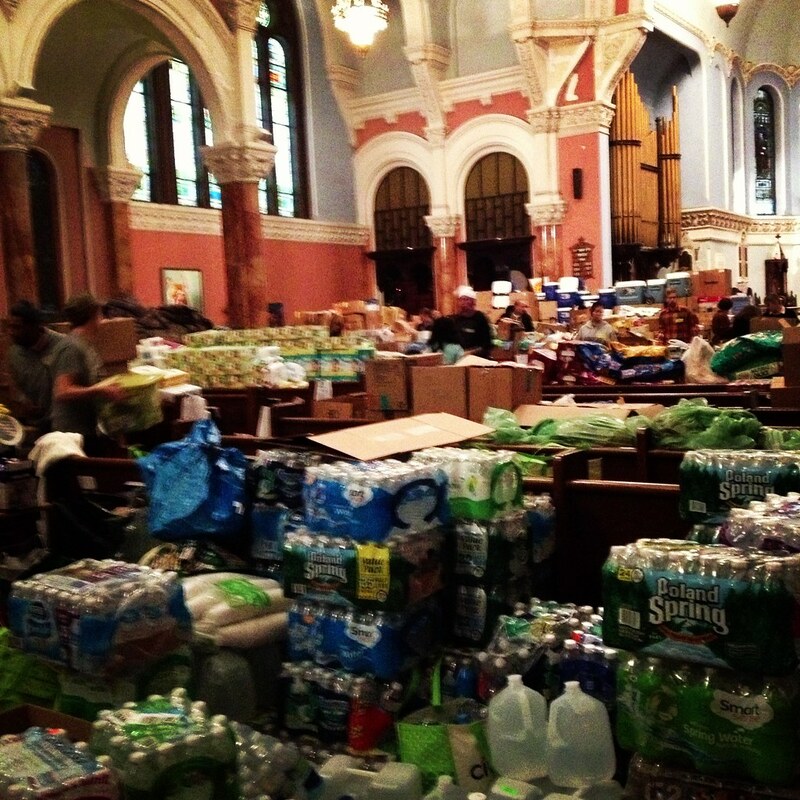 I wanted to let you know how easy it is to help the Occupy Sandy effort. If you only have a short time to spare there are jobs for that. If it's important to you to interact with people who have been affected there are jobs for that. If you have things to give this is a movement where you can see exactly what's happening to your donations. Right now we have the Sandy folks in mind because it has just happened and it's part of the news cycle but this recovery is going to be a lot longer than the attention span of your average news outlet. I think we're wildly lucky that the Occupy Movement had what could be called a dry run last year. They tested their lines of communication and their work systems and they showed as many people as would pay attention what they'd achieved. Last week the members of this movement were able to get outposts up and running and reach out to some communties before even government agencies did and now they're showing more and more people how they work and why their way can be vital to our society. I didn't understand last year. I do now. So well said, I had a similar though much more brief experience Thursday. Utterly impressed, and this is so true ... " I think we're wildly lucky that the Occupy Movement had what could be called a dry run last year. " They're doing amazing things, and I felt guilty for what little I dropped off, but was glad we did, and that the boys got to see it. Giving them some sense of what's going on.